LG’s 27-inch UltraFine 5k display has been named 2017’s ‘Best Photo Monitor’ by the Technical Image Press Association (TIPA). The monitor earned high praise in large part because “it provides superior 5K image rendering (5,120 x 2,880 pixels), along with the capability to work seamlessly at lower resolutions”, notes the press release. TIPA, considered the world’s most influential photographic and imaging press association, consists of 27 leading photo and imaging magazines from the United States, Canada and 13 other countries on five continents. The TIPA Awards are among the most respected and influential photo and imaging product awards in the world. All products that bear the TIPA Awards logo have undergone rigorous testing by TIPA’s technical committee and magazine editors. 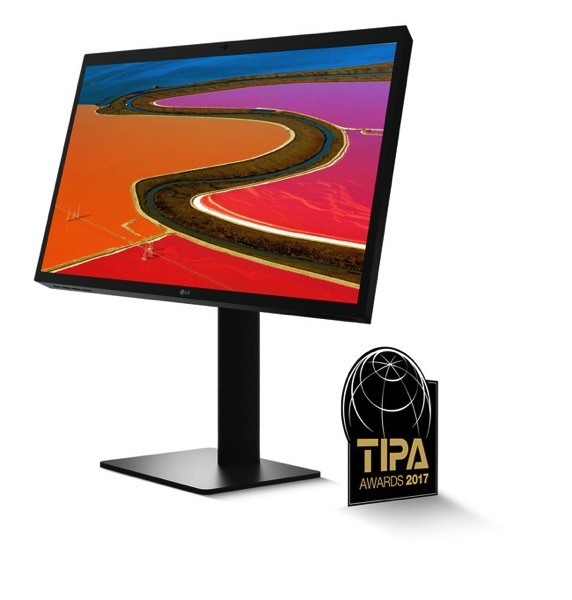 The LG 5K display, which is the only monitor to receive the coveted 2017 TIPA Award, is ideal for video editors and other creative professionals who use Apple’s line of Mac computers with Thunderbolt 3, including the new MacBook Pro. It covers 99% of the DCI-P3 colour space and also implements the company’s advanced IPS (In-plane switching) display technology, which minimizes color shift and colour loss from any viewing angle. The award-winning 5K monitor is capable of high-capacity 5K data transmission through a single Thunderbolt 3 cable, with three downstream USB Type-C ports, as well as integrated webcam and high fidelity speakers.